Thanks to the wonderful movie UP we all have turned a squirrel from a rodent to a term for a distraction. Google squirrel and the third organic result is the video clip of Dug the Dog. You can understand the shock and surprise that I felt when I found determination and complete focus in the form of a squirrel! Look closely to the photo below, and you will notice our newest neighbor Bruce the squirrel. We have named him Bruce after Bruce Wayne because of the way he hangs upside down like a bat. Bruce found our bird feeder. After falling off a couple of times, since it is supposed to be squirrel-proof, he found a solution to his challenge. Bruce, our squirrel, understands the concept of Failing Forward (a brilliant book by John C Maxwell) and after trial and error he has figured that by hanging upside down from a tree branch he can just reach the food tray on the bird feeder without putting weight on the perch. With focus, Bruce is able to help himself to a snack when needed. It does not matter if we are watching him, if our dog is watching him or even if his sidekick, a chipmunk we named Robin that catches the seeds that fall, is watching, Bruce stays focused on the task at hand. We have had other squirrels come visit and climb our tree. All of these squirrels sit there and stare at the free buffet until they give up and climb down and run off. Not Bruce he has the focus needed to reach his goals! ***Update on Bruce and our bird feeder – we have moved the bird feeder to a place Bruce can no longer reach. 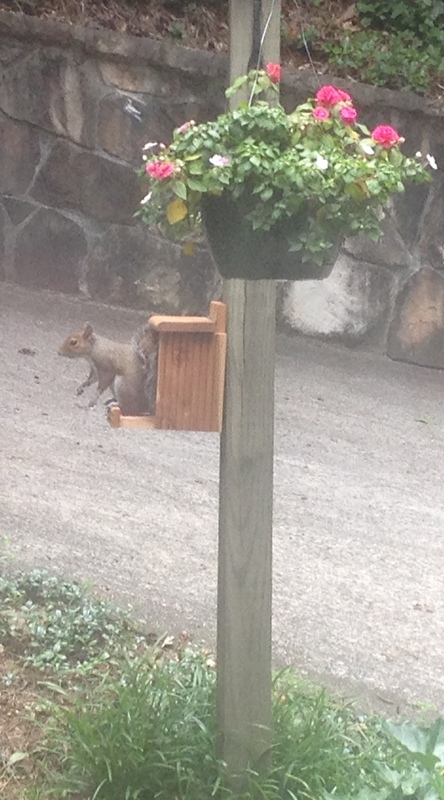 Don’t worry we also installed a squirrel feeder for Bruce. Of course a determined and focused squirrel will always find a solution. We have now found Robin, the chipmunk sidekick, jumping from the branch, landing on the bird feeder and laying down on the perch (he is light enough to not activate the spring) and knock food into the ivy, and waiting hands of Bruce, below. The lesson from this advancement is how important it is to hire the right people to work with you, and that is another blog post for another time. For now, stay FOCUSED! Chadalyst – FOCUS! If a squirrel can focus, so can you. Shut off your phone (or if you have an iPhone use the greatest gift Apple has given us) close your door and FOCUS on doing what really needs to be done!